I was checking the new Simpel Sesh schedule last week end and realized that the good old Simpel Sesh is now back with a new name- Simple Session. Big deal? Maybe nor, since, apart from the name, the oarganizing team (along with World Cup Skateboarding folks) changed their dates a little bit this year to make the visit a little bit easier weather wise. 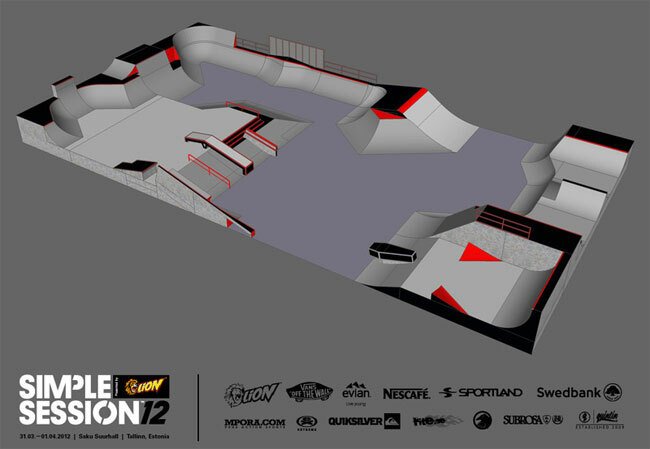 So this year’s Simple Session will take place 31 March – 1 April 2012 at the same venue in Tallinn, Estonia. In the past years, Simpel Session’s live webcast gathered almost the same amount of viewers than the webcast for Estonian Eurovison song contest and this year, you will be able to watch the event live starting Friday on isTia.Tv. So bookmark the page it is:istia.tv/3/Simple-Session-Estonia.shtml. And don't worry too much if the journey to Northern Europe is too far,istia.tv will be there to make sure you don't miss any of the outstanding action from Simpel Session 2012. But of course if you have the slightest chance to still book your flight to Tallinn, don't hesitate as this years' contest will be an event to remember.